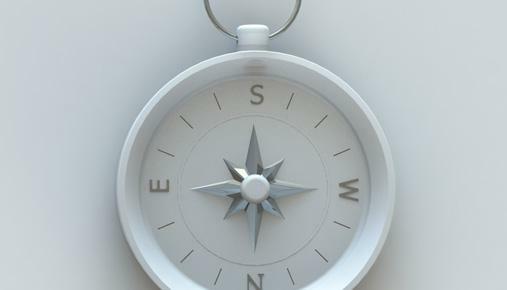 Directional trades, like long calls or long puts, offer you the chance to profit if you’re right about the direction of the underlying stock. But, having profits that aren’t capped often comes at a price—not only does the stock need to move in the right direction, it has to move enough to overcome the premium paid for the option. It’s possible, however, to structure a trade that can give you similar uncapped profit potential, with a lower initial premium outlay than a single-leg long option—or even be initiated at a net credit. Plus, if structured properly, the trade can have a high probability of not losing money at expiration. The following, like all of our strategy discussions, is strictly for educational purposes only. It is not, and should not be considered, individualized advice or a recommendation. Options trading is subject to unique risks and is not suitable for everyone. The strategies discussed are advanced option strategies and often involve greater risk, and more complex risk, than basic options trades. If you’re bullish on a stock, the strategy consists of an out-of-the-money (OTM) long single-leg call, paired with a short vertical put spread of the same (or similar) net premium. If you’re bearish, it would be an OTM long single-leg put paired with a short vertical call spread. The rationale is simple: use the premium collected from the short vertical spread to pay for the single-leg option. As long as the vertical spread remains OTM through expiration, then your losses would be limited to your transaction costs, plus or minus the small net premium paid or collected. That’s the high probability part. And if the stock price moves toward your single-leg long option strike price, it becomes closer to being in-the-money (ITM). And what is that risk? It’s the difference between the strikes in your vertical spread, plus or minus the net premium of all three legs. And don’t forget to multiply by 100, the multiplier for standard U.S. equity options. And remember those transaction costs. Spreads and other multiple-leg option strategies can entail substantial transaction costs, including multiple commissions, which may impact any potential return. So let’s say you think a stock is going to go up. Maybe your fundamental research on the company has led you to believe a rally is imminent. Or maybe the stock bounced off of a technical support level, leading you to believe it’s headed higher. Upside target parameter. How high do you think the stock could climb by expiration? Downside support parameter. Is there a price on the downside, such as a technical support level, that you view as a short-term price floor? If so, you might consider choosing that price as the short leg of your put spread. Options chain. Have a look at the bid/ask prices of the options chain and compare to your target upside and downside parameters. The trick is to find a combination of put spread and OTM call that you believe might stay within your downside parameter but offer what you feel is a satisfactory potential reward for the risk you’re taking. For example, consider the options chain in figure 1 below. Suppose a stock is trading around $244, and you believe it has a decent chance of rallying above $249 over the next few weeks. Suppose also that you’ve identified $238 as an area of support, meaning even if the stock were to decline in the near term, you think it will have a difficult time pushing below $238. 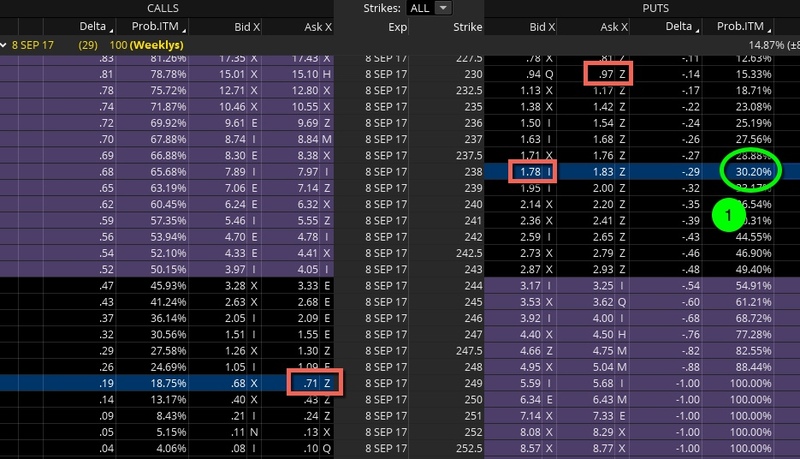 Options chain showing the strikes, bid/offer, delta, and the probability that strike might be in-the-money at expiration (“ProbITM”). Chart source: The thinkorswim® platform from TD Ameritrade. For illustrative purposes only. for a net credit of $0.10 (times the multiplier) = $10, minus transaction costs. keep the premium, less transaction costs, as your profit. make the difference between the stock price and the strike price. When you sell a vertical spread, the risk is defined by the difference between the strikes, minus the premium collected. Why? Because if both strikes are in-the-money (ITM) at expiration, you’ll likely be assigned your short strike and you’ll exercise your long strike. So in our example above, if the stock breaks below $230 at expiration, you’ll be assigned a long stock position at $238 and you’ll exercise your option to sell the stock at $230, thereby locking in a loss of $8.00 ($800 with the multiplier), minus the net premium. Normally, when selling a vertical spread, the premium collected from the sale offsets some of the risk, but in our 3-legged spread, most of that premium (all but $0.10, or $10 with the multiplier) was used to pay for the OTM call. You can attempt to lower the risk in the trade by narrowing the width of your put spread. But that means you’ll have less premium to spend and you’ll either have to choose a call that’s further OTM, or else pay a net premium to initiate the trade. With options there are always tradeoffs. Another way of analyzing this trade is by looking at the probabilities of the short spread being ITM at expiration. 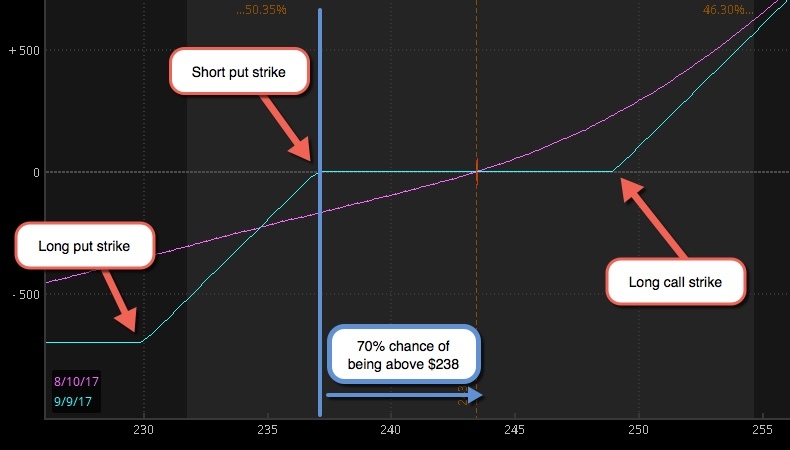 The ProbITM function in this example from the thinkorswim® platform shows the 238 strike as having roughly a 30% chance of being ITM at expiration. This means that, based on the current implied volatility, the model shows the stock having about a 70% of being above 238 at expiration. Remember above $238, both put strikes expire worthless. And if the stock goes above $249, the profit potential from the long call is unlimited. See figure 2. Questions? Refer to this primer on option probabilities. FIGURE 2. RISK GRAPH OF TRADE. The short 238-230 put vertical with the long 249 call. Chart source: The thinkorswim® platform from TD Ameritrade. For illustrative purposes only. The same setup can be used for bearish trades. But instead of selling an OTM put spread, you'd sell an OTM call spread; instead of buying an OTM call, you'd buy an OTM put. And, technically, your profit potential wouldn't be unlimited, as a stock can only go down to zero. For the bearish setup, you’d set a target price on the downside and a spot of upside technical resistance. Then you’d look at an options chain and select an OTM put to buy, and a call vertical spread to sell. Just as with the bullish spread, the full risk of your trade is the distance between the strikes in your vertical spread, plus or minus the net premium, plus transaction costs. And the ProbITM function can help you decide if the probability is worth the risk. Please note that the examples above do not account for transaction costs or dividends. Transaction costs (commissions and other fees) are important factors and should be considered when evaluating any options trade. Transactions cost for trades placed online at TD Ameritrade are $6.95 for stock orders, $6.95 for option orders plus a $0.75 fee per contract. Orders placed by other means will have higher transaction costs. Options exercise and assignment fees are $19.99.